Innocent and honest enough, to be sure. But no response... Certainly the man has prior orbligoshuns, but at least a polite declination might be in order... Nothing. Nothing at all. 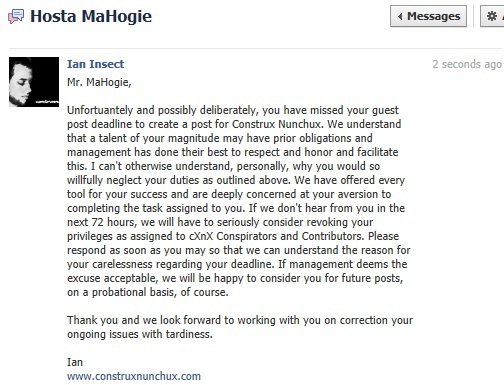 Who doesn't check Facebook obsessively and who wouldn't jump at the chance to be a part of Construx Nunchux dot qualm? We remained patient and allowed the man some time to clear his plate of all distractions. Nothing in the construx email, no texts, no notifications of any kind at all! Come on!!! But calm donne guys, there's plenty of time and maybe he was so excited about his post that he got right to work. I mean, after all, this is Hosta f**kin MaHogie we're talkin about and if ya've seen 'is work, and who of us hasn't, then you are familiar with the detail and thorough consideration he exercises, so it's wholly understandable that he's simply so engulfed in his efforts as to completely forget to confirm with us his participation and progress. So let it go let it go, go have a lettuce sandwich. Well damn. You'd think once we broke it down like that, MaHogerstonshun would've at least told us what the hang up was, but still, nothing at all. Not even an apology. 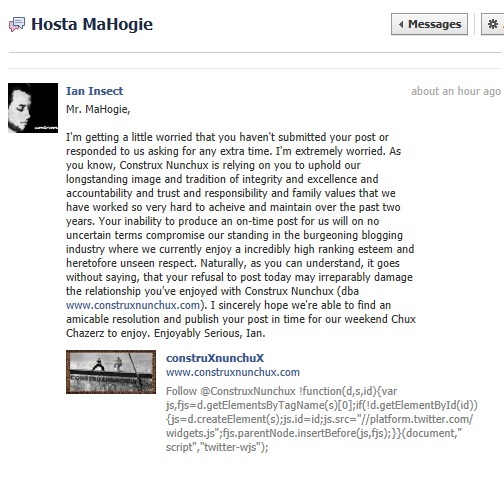 So allow us to apologize on behalf of Hosta MaHogie, because we thought we'd be receiveing and entertaining and insightful post from one of the great internet personalities of our time, MaHogie-San, but no. Due to his negligence and outright disrespect for Chux Chazerz, we are left with nothing this Friday. Thanks my one and MaHogie﻿.